NOTE - shipping to Australia recently has been taking 6+ weeks to arrive. Tutorials are shipped with a tracking number so you will see that it has left the States and is in transit. Where is it now chart listing the features in PE-Designtm NEXT and where they are located in version 10. 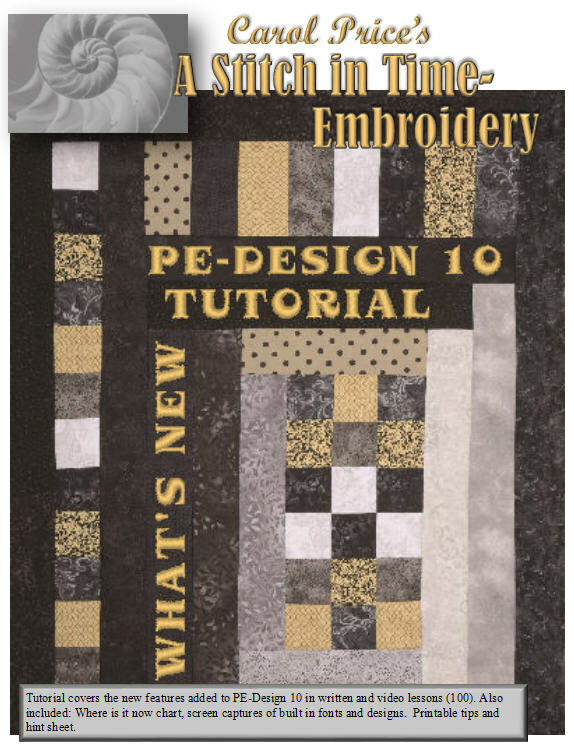 Chart with screeen shots of the designs, photostitch pictures, templates, outline objects that come with PE-Designtm 10. Chart with screen shots of each font and all the characters in that font set. Comparison chart showing the redigitized fonts. Printable short cut and hints sheet. Hints and tips are given through out the tutorial. Learn to use your digitizing software to its fullest potential. Unlike seminars, you can refer back to the tutorial over and over again whenever you need to. Watch and review a video until you are comfortable with your grasp of the subject. The tutorial is on a computer DVD+ disk (these are NOT playable in the television DVD player). You must have Adobe Acrobat Reader on your computer in order to view the tutorial. Visit the Adobe website to download their free Acrobat Reader. This tutorial will run with Windows 10, 8, 7, Vista and Windows XP. Make sure to use ONLY ADOBE ACROBAT READER to view the PDF file and be able to play the videos. The videos will NOT be recognized by any other PDF reader program. Visit the Adobe web site and download the free reader program. Make sure install the TSCC.dll file as described on the card insert in the DVD box AND turn off the computer and restart it so that the driver will be installed. Some computers have this driver and some are missing it. If the videos do not play through the PDF document please install this driver. The PC must have a DVD+ drive in order to play the tutorial. The tutorial does not run or has not been tested on computers/tablets running Android, Linux or Apple OS. If you are having trouble geting Adobe Reader to work on your computer, please see the FAQ page for detailed directions. View a video on You Tube to help with running the tutorial on Windows 10. Note: the tutorials are NOT licensed for public viewing, only for personal use. I am available to teach in person.. Note: resale. copies, transfer of these items is not allowed as per the end user license agreement. Because of the nature of the product, we do not allow refunds of design sets or tutorials. If the software is defective, it will be exchanged for the same product. Copyright (c)1998 - 2017 Techno Babe, Inc.